Neuro-oncologist Vijay Ramaswamy, M.D., Ph.D., is fascinated with the biology of ependymoma. Dr. Ramaswamy practices at The Hospital for Sick Children in Canada. He is studying the molecular biology of ependymoma to develop therapies to improve survival. His research is aided by an award from the CERN Foundation, the inaugural CERN Basic Science Ependymoma Research Fellowship. Dr. Ramaswamy received the competitive award in late 2015, which provides $50,000 for two years, and he’s already made strides in his research. In 2016, Dr. Ramaswamy and Michael Taylor, M.D., Ph.D., a neurosurgeon at The Hospital for Sick Children and a scientist at the University of Toronto in Canada, completed the largest-ever study analyzing 820 posterior fossa ependymoma cases. The study classified the molecular biology of the tumors and reviewed their clinical information. The results were both predictable and surprising, says Dr. Ramaswamy. “We confirmed that the molecular subgroup of the tumor matters the most,” he explains. The two distinct subgroups of posterior fossa ependymoma are Group A and Group B. Group A is prevalent in infants and young children (younger than age 5), and has poor outcomes and the most deaths. Group B is common in young adolescents (older than age 6) and adults, and conversely, has better outcomes. “What surprised us was that the treatment mattered,” says Dr. Ramaswamy. Surgery and radiation were really important treatments for patients with Group A tumors to have good outcomes. “But if patients had an incomplete surgical resection, they did poorly whether or not they had radiation,” says Dr. Ramaswamy. The study also showed that Group B ependymoma could be cured with surgery alone. “If we could spare patients the side effects of radiation, that would be impactful,” says Dr. Ramaswamy. The study was published in the Journal of Clinical Oncology and furthers his aim is to develop a better treatment risk clarification for children with posterior fossa ependymoma. 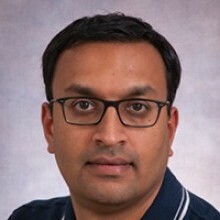 This past year, Dr. Ramaswamy also teamed with Thomas Merchant, D.O., Ph.D., at St. Jude Children’s Research Hospital, and the Children’s Oncology Group (COG) to analyze 120 ependymoma cases. Dr. Ramaswamy and Dr. Merchant analyzed the DNA of tissue samples from COG. The tissue was repurposed from an ependymoma study in 2007 and tissue used for other reasons. Then, the researchers sent the molecular profile of the tissue samples back to COG to match the clinical details. Dr. Ramaswamy’s current clinical trial is investigating therapeutic targets for recurrent ependymoma in children. His goal is to improve survival and quality of life. “I want to give kids therapy that allows them to reach their full potential and do what they want in life,” says Dr. Ramaswamy. This means avoiding very aggressive treatments that leave children with long-term side effects. Dr. Ramaswamy’s clinical trial is based on results from a 2013 study by researchers at The Hospital for Sick Children that tested therapeutic targets in the lab. “By translating those results to a clinical trial, this is a true bench to bedside trial,” he says. Dr. Ramaswamy is excited about the next few years of ependymoma research. “More good quality scientist are getting involved, and more clinicians and scientists are joining to design innovative studies,” he says. Dr. Ramaswamy is grateful to the CERN Foundation fellowship. “It gives me protected time for research and more so, has connected me with the amazing CERN community,” he says.